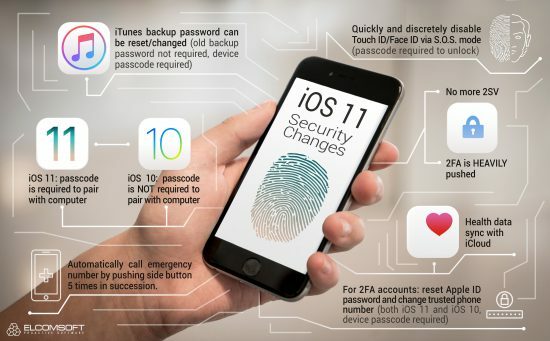 iOS 11 introduced multiple changes to its security model. Some of these changes are highly welcome, while we aren’t exactly fond of some others. In this quick reference guide, we tried to summarize all the changes introduced by iOS 11 in the security department. Additionally, in macOS High Sierra, Desktop and Documents folders now sync with iCloud (user can disable). iOS 11 has arrived, now running on every second Apple device. There could not be a better time to reminiscent how iOS forensics has started just a few short years ago. Let’s have a look at what was possible back then, what is possible now, and what can be expected of iOS forensics in the future. Can You Unlock That iPhone? “Can you unlock that iPhone?” is one of the most common questions we hear on various events and from our customers. There is no simple answer, but more often than not some options are available. Just a few years back, the most common question was “can you crack that password?” We are still being asked that every other day, but locked iPhones are now more abundant than unknown passwords. There is a simple explanation for that: the iPhone is an ultimate source of evidence. That, before we even mention the many urgent cases when the phone needs to be unlocked. Cover all possible scenarios in one short article would not be possible; for (much) more details you are welcome to read our Smartphone forensics book that explores the topic in depth. Keep reading to see what can be done in some cases. Posted in Did you know that...?, Elcom-News, Security | Comments Off on Can You Unlock That iPhone?